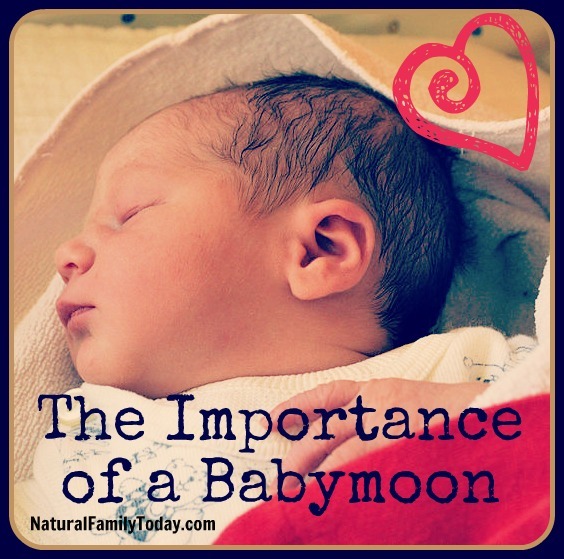 Expectant parents often fear the changes a new baby will bring, especially sleepless nights. What new parent wouldn’t want a how-to book that promises their baby will be sleeping through the night by three to eight weeks? Although demand feeding is endorsed by the Academy, WHO, and La Leche League among others, “Babywise” claims that demand feeding may he harmful and outlines a feeding schedule in contrast to it. 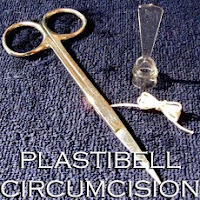 The book makes numerous medical statements without references or research, despite that many are the antitheses of well-known medical research findings. In 190 pages, only two pediatric journals are referenced with citations dated 1982 and 1986. The book’s other author is Gary Ezzo, a pastor with no medical background. 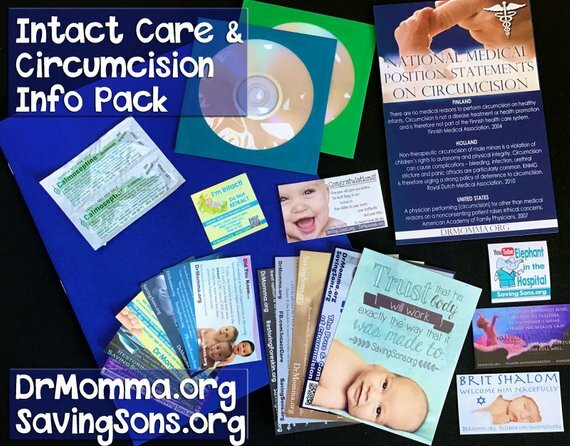 Ezzo’s company, Growing Families International (GFI), markets the book as “ideally written” for “obstetricians, pediatricians, or health-care providers to distribute to their patients.” (GFI promotes the same program under the title “Preparation for Parenting,” a virtual duplicate with added religious material). 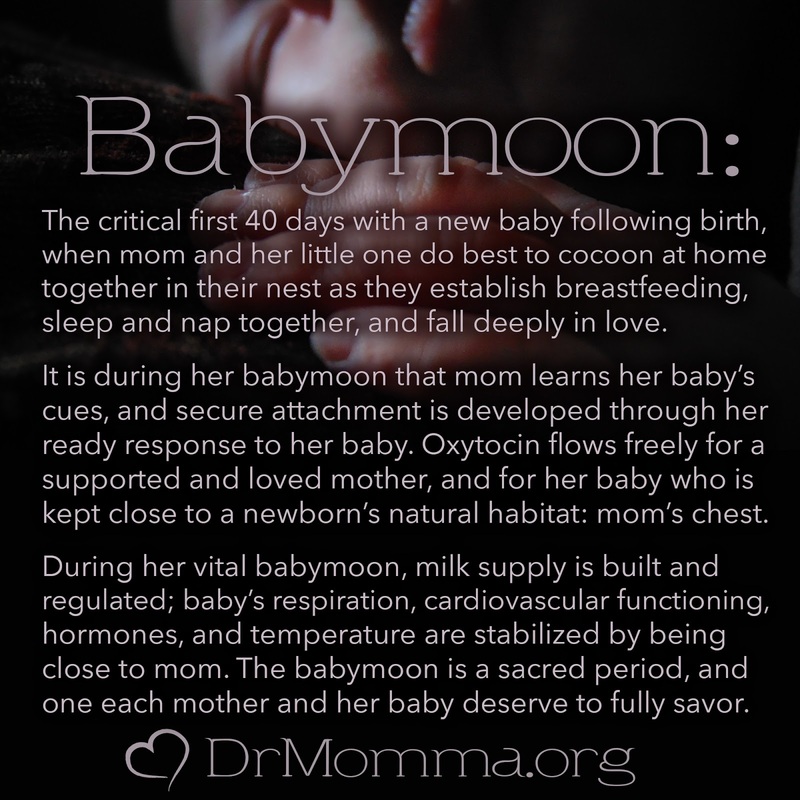 Unfortunately, the schedule in “Babywise” does not take into account differences among breastfeeding women and babies. According to one report, differences of up to 300 percent in the maximum milk storage capacity of women’s breasts mean that, although women have the capability of producing the same amount of milk over a 24-hour period for their infants, some will have to breastfeed far more frequently than others to maintain that supply. 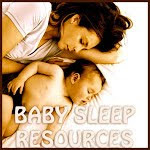 Babies must feed when they need to, with intervals and duration determined according to a variety of factors in temperament, environment, and physiological makeup. 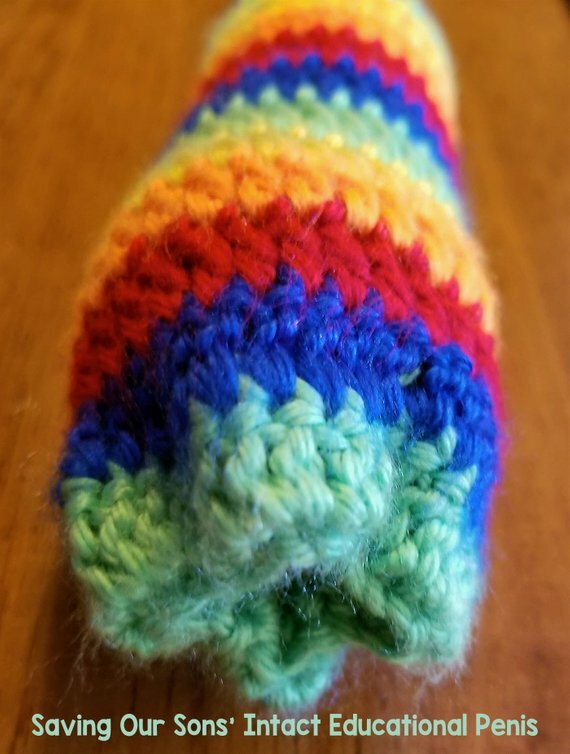 Averages may fit into a bell-shaped curve, but some babies will require shorter intervals. (Daly S., Hartmann P. “Infant demand and milk supply, Part 2. The short-term control of milk synthesis in lactating women.” Journal of Human Lactation; 11; (1):27-37). My review of the low weight gain and FTT accounts associated with “Babywise” revealed several disturbing trends. Parents were often adamant about continuing with the feeding schedule, even when advised otherwise by health care professionals. They were hesitant to tell their physicians about the schedule, making it difficult to pinpoint the cause for the weight gain problems. Many elected to supplement or wean to formula rather than continue breastfeeding at the expense of the schedule. 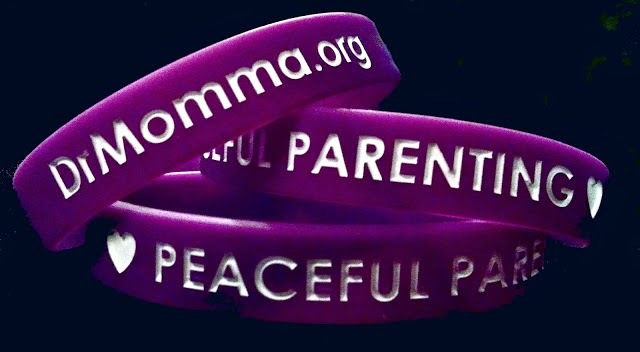 The parents’ commitment call be especially strong when they are using the program for religious reasons, even though numerous leaders within the same religious communities have publicly expressed concerns. 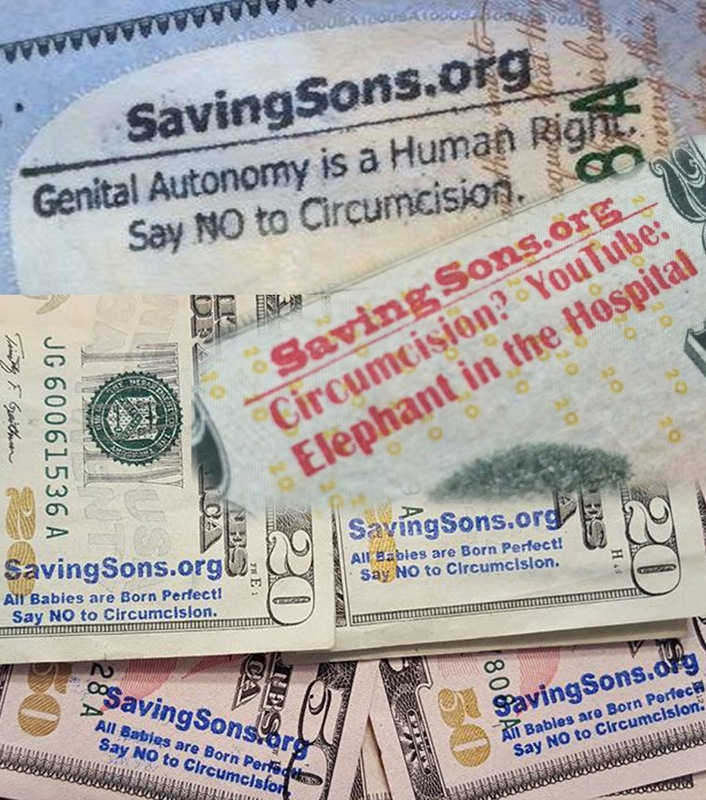 or distribute in your neighborhood. Read more from Chuong-Kim at Dr. Ben Kim's homepage. Among parents of infants these days, there is constant debate about how to respond to a baby’s cries. 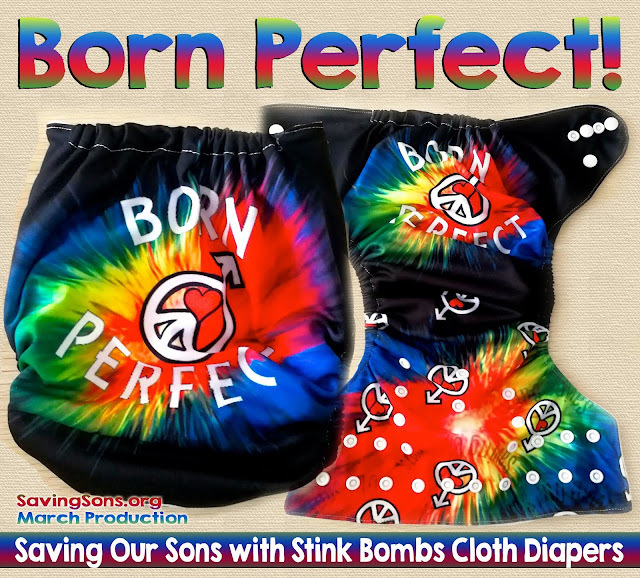 On one hand, there are proponents of the “cry it out” method, where the baby is left alone to cry in the hopes that he or she will eventually stop. 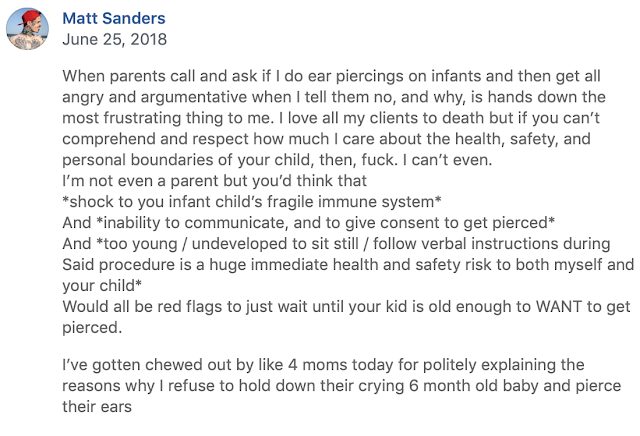 On the other hand, there are the “attachment parents” who respond immediately to their crying babies and attempt to soothe them using various methods including holding and cuddling. While the cry-it-out method (CIO) has been popular in previous years, attachment parenting (AP) is gaining a foothold among new parents today. Results of studies in psychology indicate the AP approach to crying is most likely to result in an emotionally and physically healthy child. 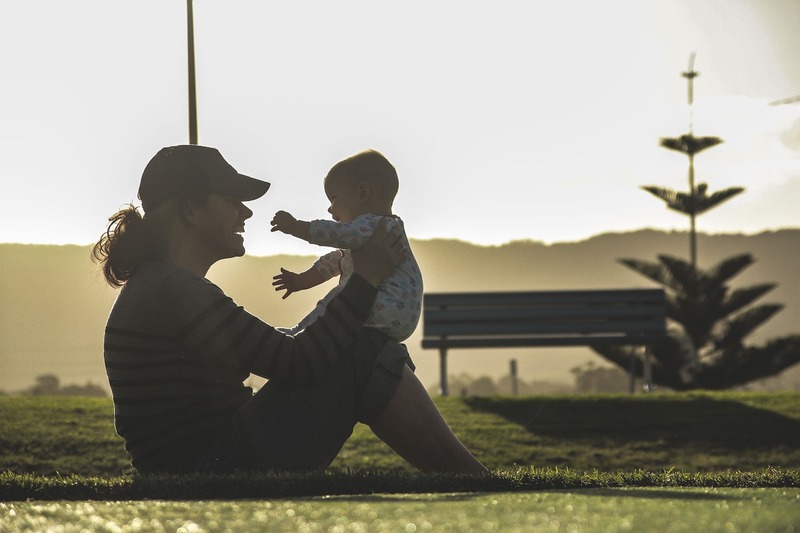 Attachment theory originated in the late 1960s when psychologist John Bowlby postulated that a warm, intimate relationship between caregiver and infant is necessary for optimal health as well as for basic survival. As such, each individual is born well-equipped with reflexes and instincts for interacting with their primary caregiver, which is often times the mother. For example, infants quickly learn to recognize and prefer both their mother’s voice and smell. 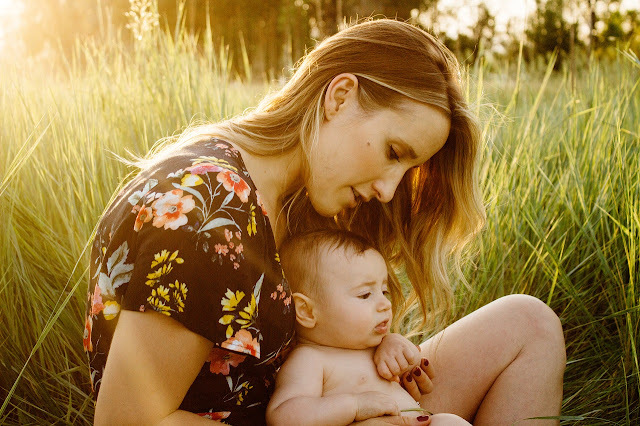 As babies develop some locomotor control they display their desire to be close to their caregivers by reaching toward their mother or father to be picked up or by crawling toward them. From an evolutionary perspective, these behaviours have survival value. Babies who lack such attachment behaviours will stray from their caregivers and are more likely to get lost, attacked, and perish. An infant’s cry is also intended to increase the likelihood of its survival, as a mother’s instinct is usually to go to her child at the first sign of distress. We live in an age where we can know that the baby is safe in another room, despite the loudness of his cries. 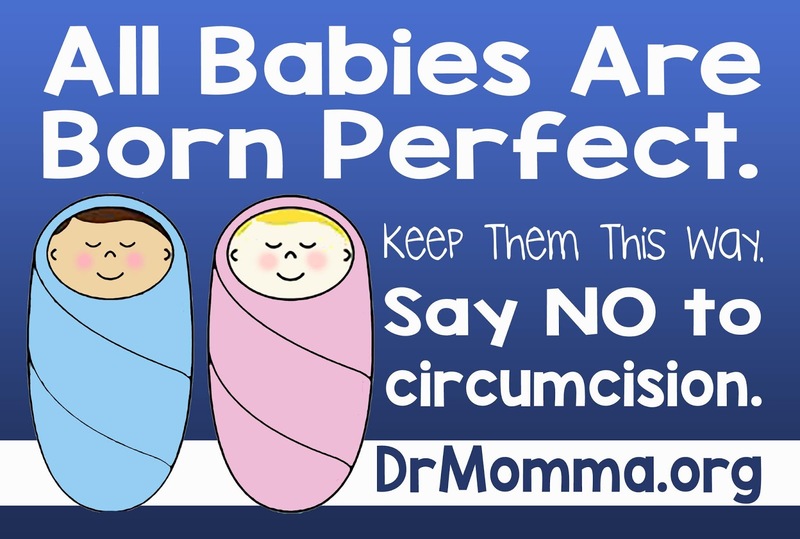 Does this mean we should leave babies to cry on their own? CIO proponents often advise that babies left to cry will eventually stop, and the duration of future crying bouts will decrease. What are the emotional consequences of crying for the infant when she is left unattended? Bowlby and colleagues initiated a series of studies where children between the ages of one and two who had good relationships with their mothers were separated from them and left to cry it out. Results showed a predictable sequence of behaviours: The first phase, labeled “protest”, consists of loud crying and extreme restlessness. The second phase, labeled “despair”, consists of monotonous crying, inactivity, and steady withdrawal. The third phase, labeled “detachment”, consists of a renewed interest in surroundings, albeit a remote, distant kind of interest. Thus, it appears that while leaving babies to cry it out can lead to the eventual dissipation of those cries, it also appears that this occurs due to the gradual development of apathy in the child. 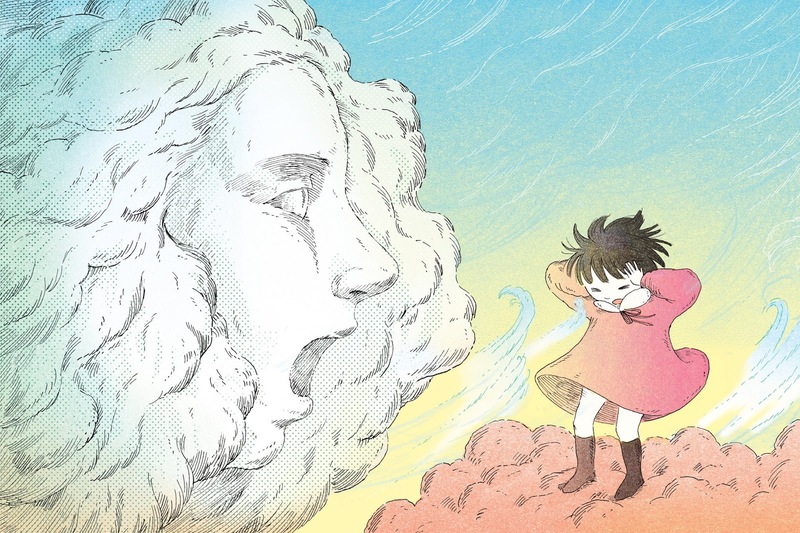 The child stops crying because she learns that she can no longer hope for the caregiver to provide comfort, not because her distress has been alleviated. Do babies cry more when they are attended to? A 1986 study concluded just the opposite: the more a mother holds and carries her baby, the less the baby will cry and fuss. Cross-cultural studies also show that parents in non-Western societies are quicker than parents in Western societies to respond to their crying babies, and babies in non-Western societies cry for shorter spans of time. Caregivers in 78% of the world’s cultures respond quickly to an infant’s cries. 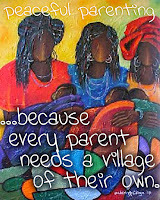 For instance, Efe caregivers in Africa respond to a baby’s cries within ten seconds at least 85% of the time when the baby is between three and seven weeks, and 75% of the time when the baby is seventeen weeks. 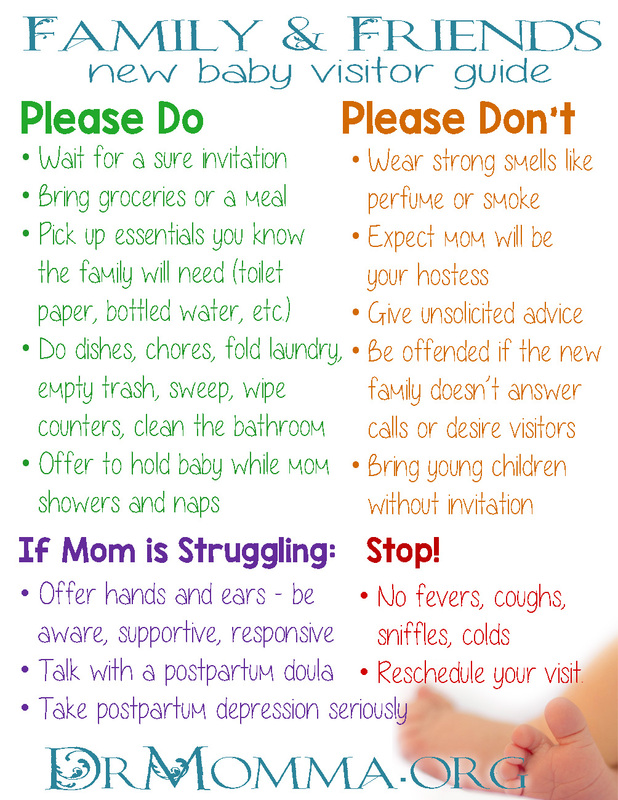 !Kung caregivers respond within ten seconds over 90% of the time during the baby’s first three months, and over 80% of the time at one year. 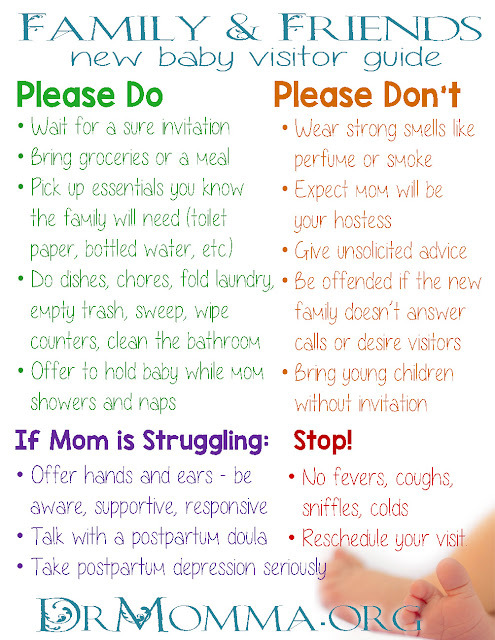 In contrast, American and Dutch caregivers have been found to be deliberately unresponsive to an infant’s cries almost 50% of the time during the baby’s first three months. Infants in non-Western societies have been found to fuss just as frequently as those in Western societies, but due to the prompt response of caregivers in non-Western societies, the overall cumulative duration of crying is less than what occurs in Western societies. According to attachment theory, many babies are born without the ability to self-regulate emotions. That is, they find the world to be confusing and disorganized, but do not have the coping abilities required to soothe themselves. Thus, during times of distress, they seek out their caregivers because the physical closeness of the caregiver helps to soothe the infant and to re-establish equilibrium. When the caregiver is consistently responsive and sensitive, the child gradually learns and believes that she is worthy of love, and that other people can be trusted to provide it. She learns that the caregiver is a secure base from which she can explore the world, and if she encounters adversity she can return to her base for support and comfort. This trust in the caregiver results in what is known as a secure individual. It has been suggested in the past that CIO is healthy for infants’ physical development, particularly the lungs. 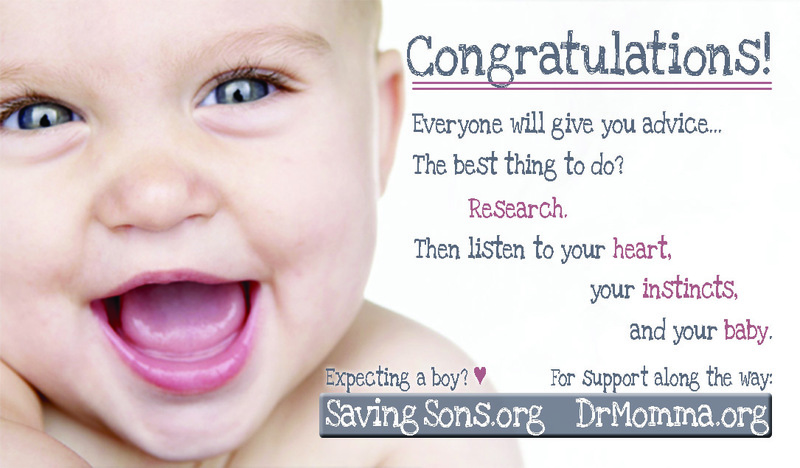 A recent study looking at the immediate and long-term physiologic consequences of infant crying suggests otherwise. The following changes due to infant crying have been documented: increased heart rate and blood pressure, reduced oxygen level, elevated cerebral blood pressure, depleted energy reserves and oxygen, interrupted mother-infant interaction, brain injury, and cardiac dysfunction. The study’s researchers suggested that caregivers should answer infant cries swiftly, consistently, and comprehensively, recommendations which are in line with AP principles. 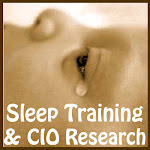 CIO supporters tend to view their infants’ cries as attempts to manipulate caregivers into providing more attention. 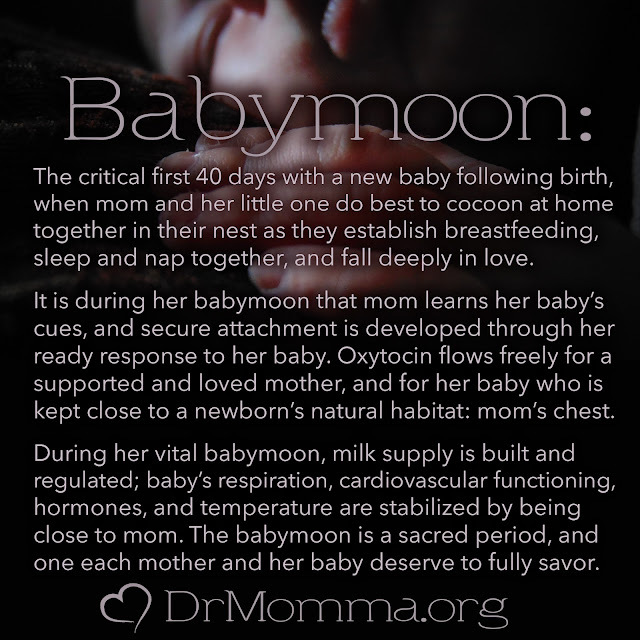 Holding this view can be detrimental to the immediate and long-term health of the baby. In the field of cognitive psychology there exists the premise that our thoughts underlie our behaviour. Thus, if we think positively about an individual, our behaviours toward them tend to be positive as well. Conversely, if we think negatively about an individual, we will behave correspondingly. Consider people in your own life whom you consider manipulative – how does that perception influence your behaviour toward them? It is unlikely that the interpretation of a manipulative personality will result in the compassionate, empathetic, and loving care of that individual. Infants, quite helpless without the aid of their caregivers, may suffer both emotional and physical consequences of this type of attitude. When faced with a crying baby, it may be prudent to ask yourself the following questions: Why am I choosing this response? 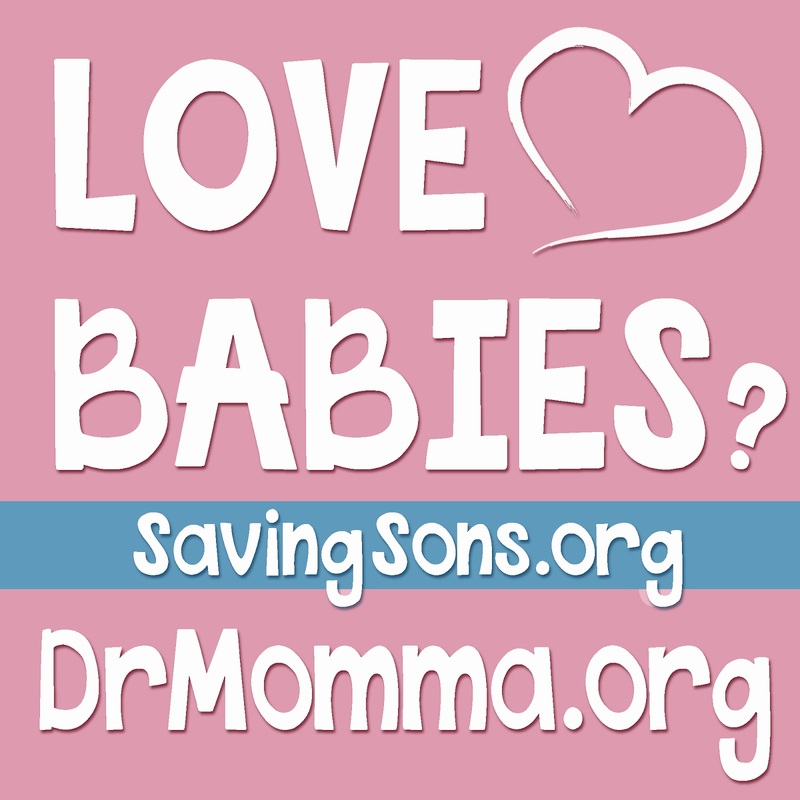 Do I want my baby to stop crying because he feels comforted and safe, or do I want my baby to stop crying for the sake of stopping crying? What is my baby learning about me and the world when I respond in this manner? 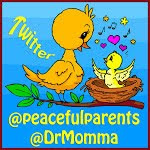 If I were a baby and was upset, how would I want my caregivers to respond? Campos, J., et al. (1983). Socioemotional development. In P. Mussen (Ed. ), Carmichael’s Manual of Child Psychology: Vol. 2. Infancy and Developmental Psychobiology. New York: Wiley. Craig, G., Kermis, M., & Digdon, N. (1998). Children Today. Scarborough, ON: Prentice-Hall. Dacey, J. & Travers, J. (1996). Human Development Across The Lifespan (4th Ed). Boston: McGraw-Hill. DeCasper, A., & Fifer, W. (1980). 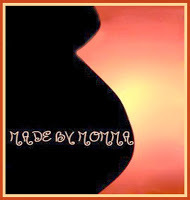 Of human bonding: Newborns prefer their mothers’ voices. Science, 208: 1174-76. Gleitman, H. (1996). Basic Psychology (4th Ed). New York: W.W. Norton. Hunziker, U. & Barr, R. (1986). Increased carrying reduces infant crying: A randomized controlled trial. Pediatrics, 77(5): 641-8. Luddington, Hoe, S. Cong, X., & Hashemi, F. (2002). 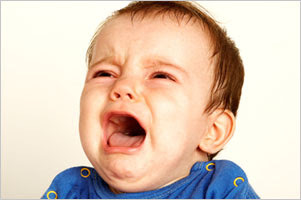 Infant crying: Nature, physiologic consequences, and select interventions. Neonatal Network, 21(2): 29-36. Macfarlane, A. (1975). Olfaction in the development of social preferences in the human neonate. Parent-Infant Interaction. Amsterdam: CIBA Foundation Symposium. Mikulincer, M., & Shaver, P. (2001). Attachment theory and intergroup bias: evidence that priming the secure base schema attenuates negative reactions to out-groups. Journal of Personality and Social Psychology, 81(1): 97-115. Miller, R. (2000). Dysfunctional relationships. In R. Kowalski & M. Leary (Eds. ), The Social Psychology of Emotional and Behavioral Problems: Interfaces of Social and Clinical Psychology. Washington, DC: APA. Waters, E., Wippman, J., & Sroufe, L. (1979). Attachment, positive affect, and competence in the peer group: Two studies in construct validation. Child Development, 50: 821-829. 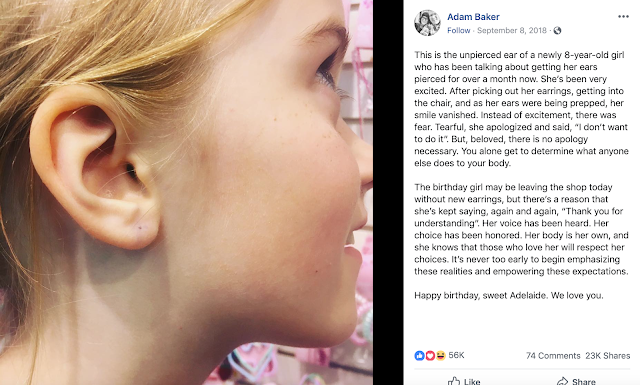 Another father, Adam, demonstrates the honoring of consent, personal choice, and agency with his 8 year old daughter on the topic of ear piercing. Original post. Infant ear piercing is painful, risky, and has no benefits for any baby. 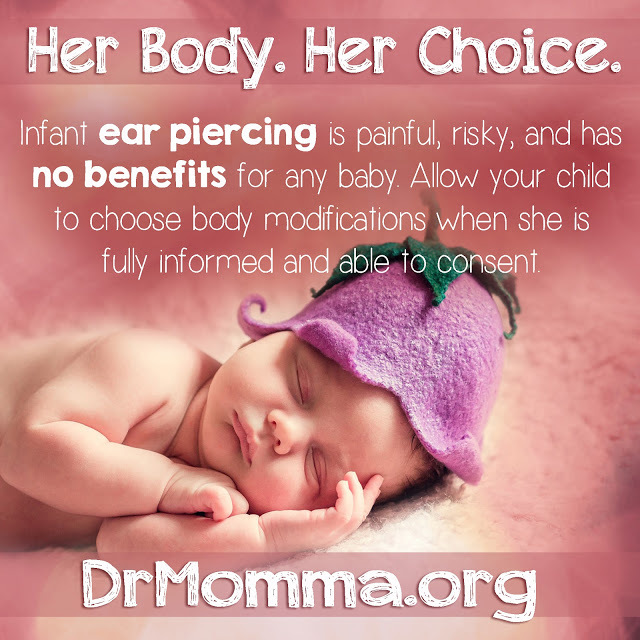 Allow your child to choose body modifications when she is fully informed and able to consent. 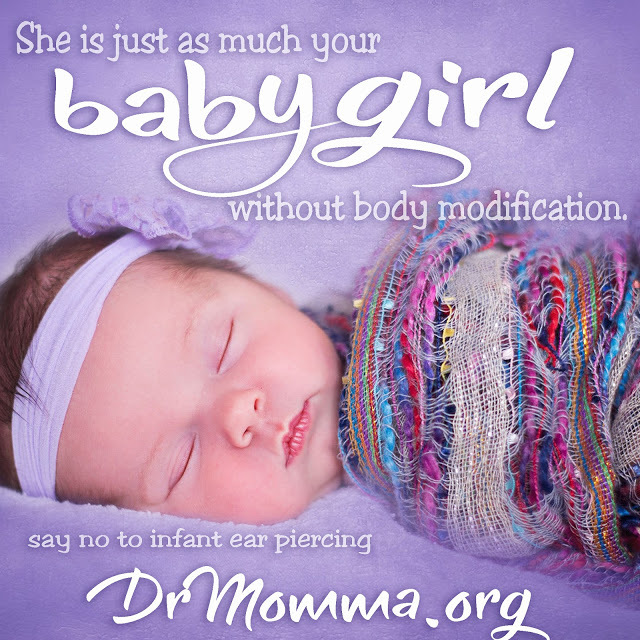 She is just as much your baby girl without body modification. Say NO to infant ear piercing. Darcia Narvaez, Ph.D., is Associate Professor of Psychology at the University of Notre Dame and Director of the Collaborative for Ethical Education. Her current research examines the effects of parenting on child and adult outcomes. 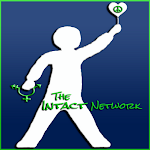 Narvaez has developed several integrative theories: Adaptive Ethical Expertise, Integrative Ethical Education, Triune Ethics Theory. She spoke at the Whitehouse's conference on Character and Community, and is author/editor of three award winning books: Postconventional Moral Thinking; Moral Development, Self and Identity; and the Handbook of Moral and Character Education. Her text, Human Nature, Early Experience, and the Environment of Evolutionary Adaptedness was a fantastic addition to a growing body of literature on a healthy, happy, babyhood. Visit Dr. Narvaez' website for additional books, papers, classes, websites and contact information. 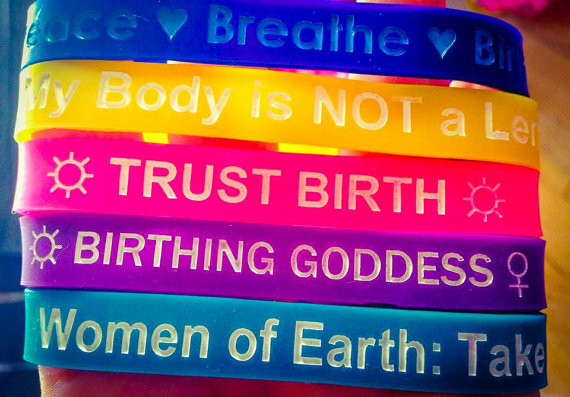 Informational items, lanyards, totes, magnets, bumper stickers, bracelets, etc., can now be found on Etsy. *Note that stamping cash is legal, but these can be used for stamping on any type of paper, note pads, envelopes, used books before donating, etc.